Whether 2012 was the best year of your life or a bit of a damp squib, the fact is it'll be over soon, to be replaced by another year, this one going by the name of '2013'. Now, with a number like '13' among the mix if digits, the more superstitious among you may already be feeling a bead of sweat forming on your brow in anticipation of what the next 365 days may bring. But the chances are it'll be just fine. It might even be wonderful (though let's not build our hopes up, eh). There is at least one way you can guarantee a splendiferous start to the year, however, and that's by going along to London's New Year's Day Parade, an event so big and boisterous that if the metropolis was a human being, it might well ask itself: "Will I be able to handle all the excitement and jollity without spontaneously combusting?" Take it from me, London, you'll be just fine. Right, let's cut to the chase and furnish you with the important details. 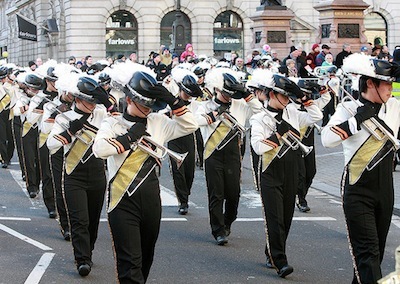 The 2013 New Year's Day Parade gets underway at 11.45am outside the Ritz Hotel on Piccadilly, a short walk from the north-east corner of Green Park. The two-mile route will take the many floats and performers along to Piccadilly Circus, down Lower Regent Street, along a little bit of Pall Mall to Cockspur Street, around Trafalgar Square, and along Whitehall to Parliament Street. The whole shebang is scheduled to end at around 3pm. The 27th New Year's Day Parade comprises more than 10,000 performers (think marching bands, cheerleaders, acrobats, clowns, and more) from 20 countries, with around half a million visitors expected to line the route – so be sure to arrive in good time to secure a decent viewing spot.